The standards correlation for this activity is coming soon! 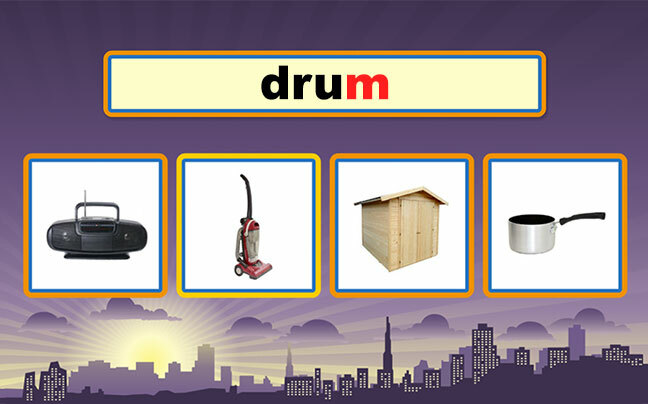 In Which Final Sound?, students match the final sound from their word to the picture of the object whose name ends with the same sound. with a sample word list! Note: Although this activity is designed for the grade levels above, it can also be used as a remediation or enrichment activity at any grade level with an appropriate word list. Phonological awareness involves hearing, identifying, blending or manipulating phonemes (sounds). Students need to be able to apply their knowledge of phonemes to develop phonics skills and to ultimately become better readers. Kindergarten students begin to make connections between sounds (phonemes) and letters (graphemes) when learning the alphabet. Throughout primary grades, students learn to identify initial and final sounds, as well as blend and segments sounds. Phonological awareness practice provides a solid foundation for early readers to build and become proficient in phonemics and reading. How to teach: Teachers can use Which Final Sound? as a whole group activity to introduce or review final sounds. Which Final Sound? can also be assigned as an independent practice activity during literacy centers or homework. Because words are read aloud, non-readers can successfully play the game. Students can click on the Word button to listen to the word again or the Sentence button to hear the word used in a sentence. When students roll over the picture, the word associated with the picture will be said aloud. Students will receive immediate feedback when they answer incorrectly. Students can attempt to answer until they have selected the correct answer. Teaching Tip: Which Final Sound? is best suited for students in K-2 who are developing phonological awareness. The learning game can also benefit English Language Learners (ELLs). The audio and visual features can help ELLs build everyday vocabulary.